This technical note will show you how to review and code documents offline. Lexbe eDiscovery Platform is designed for online access, review and coding, but documents can also be reviewed and codded offline, if an extended period of offline access is anticipated. Examples would be document review or privilege review during a long airplane ride without internet access, or the possibility of needing to access documents during a deposition when internet access is unavailable. • Briefcase can be downloaded or made available to recipient through a single secure downloadable link. • This option is perfect for cases that require experts to access a set of documents. 1-From the Case>Add Case documents, run or update control numbers assignment on all documents. 2-Wait for this processing step to complete. Please note that this process will be fast depending on the size of the case, which means that it will be fast if it is just a few batches are updated otherwise it can take longer. 3-Go back to the Browse page, and then show fields that user(s) wishes to see, sort on, filter on, or edit. Here are some examples include: 'Control Number', 'Is Responsive', 'Is Confidential', 'Is Privileged', Work-Product', 'Doc Date', 'Date Sent', 'Author/Sender', 'Receiver', 'Subject', 'Bates', etc. You may also show the 'Folder' field if used for coding, but you will not be able to update that field on the metadata upload. 4-You can also create a custom check-box tag to identify and keep track of the documents you will share with the non-users or experts offline. 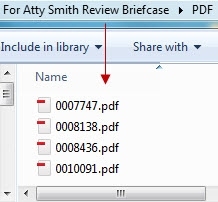 (e.g., 'For Atty Smith Review Briefcase', or 'For Expert Jones Review'). -To make easier to use, possibly hide column A with Lexbe Doc ID (do not delete or re-order as this breaks document association). This can be deleted if there is no need to edit and re-upload. -To open a document locally, click on the document link in Excel under the 'Doc ID' column. This will open the PDF version of the file. Please note that you can use Excel metadata update to copy the Bates leading designation and the number (with leading '0's into custom field 1). Concatenate the columns using leading '0' (e.g. '=C2&" "&"000000"&D22 the number'). The number of 0s will need to be adjusted as the number increases. After creating the number, the field in Excel needs to be copied with a 'copy values' step. 6-Select all the documents and then export to a Briefcase. You can modify document coded data and tag multiple files (modify multiple fields simultaneously), or import load files by generating custom Excel spreadsheets that can be uploaded into a case in Lexbe eDiscovery Platform. d-On the 'Control Number' section you can also select 'Stamp Existing Control Numbers on PDF Pages' if desired). 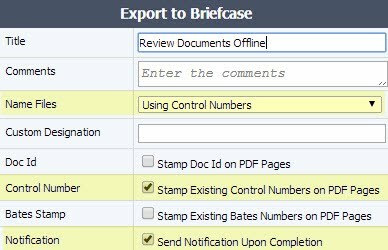 After exporting the document to a briefcase, you can either 'Go to Download Briefcase Page', 'Stay on Current Page' or 'Cancel Briefcase' action. You should expect an approximately 10 GBs/day rate (~200,000 pages) within your Lexbe eDiscovery Platform account (combined all cases) to create Productions (including Bates numbering) for Standard PDF productions and 2.5 GBs/day rate (~50,000 pages) if TIFF Productions are selected. Your download time is in addition to this, and will depend on your internet download speed. PDF productions will be approximately the size produced, while TIFF productions expand significantly (generally 3-10X, but sometimes substantially more depending on the specific files). Please also note that production creation increases your monthly usage. e-Wait for Briefcase to be completed and the email notification. f-Download and expand Briefcase on Desktop. • Retain the original version of the spreadsheet to allow restoration of original data if incorrectly coded. • Use the Metadata Update function to update coded to changed metadata. Any unused fields or records (documents) can be deleted. • Rename the Excel spreadsheet using the naming format: 'AnyFileName.lexbemultidocupdate.xlsx'. The file must be in an Excel format with an XLSX extension, supported by the last two versions of Excel (2010 and 2013). Older Excel formats (e.g., XLS) or other Excel formats such as XLSM are not supported. • After completion apply Quality Control procedures to check results and then upload the Excel to the case. We also offer Project Management and Technical Services if engaged to support your document review offline efforts by helping to execute specific requests for document identification and metadata upload. Please contact your sales rep or our Support Center if needed.